By Kori ~ August 29th, 2012. Earlier this month, Dad (John), Colby, and I spent three jam-packed days in Portland, Oregon, for the fifth annual Wine Bloggers Conference. 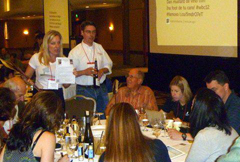 We were joined by over 300 fellow wine bloggers, wine industry participants, and media members for tastings, keynote addresses, breakout sessions, and visits to local vineyards and wineries. During the conference, we participated in two Live Wine Blogging sessions (Whites & RosÃ©s on Friday and Reds on Saturday) which featured wines poured for us by winery representatives, often the winemaker or owner themselves, in a fast and furious â€œspeed datingâ€-like format. We tasted and reviewed the wines live, posting comments on Twitter. Since many of you may not have been viewing the Twitter stream at that time, I am posting a recap here. 2011 Recuerdo Wines Torrontes 2011 (Argentina): Apple, lime, touch of grapefruit, very crisp. 2011 Esporao Duas Castas Semillon Viosinho (Portugal): Just launched, avail 6 states. Pear, minerality, creamy. 2011 PEPI Sauvignon Blanc (California): Made for food, found often in restaurants. Tons of grapefruit, lime, crisp & refreshing. 2009 Decibel Sauvignon Blanc (Hawke’s Bay, New Zealand): Beautiful wine, grapefruit, lime, creamy. 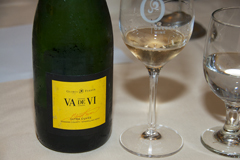 NV Gloria Ferrer Va de Vi Sparkling Wine (Sonoma County, California): 89% PN, 8% Chard, 3% Muscat. Luscious apple, pear, yeast. Delish! 2010 Cornerstone Cellars Chardonnay (Willamette Valley, Oregon): Pear, creamy yet crisp, minerality, begs for food. NV Sokol Blosser Evolution White Wine (America): Grapes from OR, WA, CA. Blend of 9 varieties. Very aromatic! 2011 Domaine du Tariquet Classic Cotes du Gascogne (France): Ugni Blanc-Colombard blend. Floral, citrus, mineral. 2011 Milbrandt The Estates Ancient Lakes Dry Riesling (Evergreen Vineyard, Columbia Valley, Washington): RS: 0.4% Dry, wet stone, lime, crisp. Lovely! NV Domaine Chandon Etoile Sparkling RosÃ© (Carneros, California): Toasted nuts, raspberry, strawberry, creamy. While there were many good wines, as you can see from the Quality ratings, our favorites were the 2009 Decibel Sauvignon Blanc, the NV Gloria Ferrer Va de Vi Sparkling Wine, and the 2011 Milbrandt The Estates Ancient Lakes Dry Riesling. Live Wine Blogging is a fast-paced process but lots of fun. Iâ€™ll be posting a recap of the Reds session next week. Iâ€™m a big fan of Sauvignon Blanc from New Zealand, so Iâ€™m going to look for the 2009 Decibel Sauvignon Blanc, thanks for the tip! It sounds by your description, and by its price to be similar to: Kim Crawford, which is my current favorite. Hope you can find the Decibel. If you do, let us know what you think of it. Kim Crawford is one of our favorites, too. There are similarities between KC and Decibel though I think Decibel is a bit creamier. Here’s to delicious NZ Sauv Blancs…Cheers! Wow, your work is incredible! Very inspiring to see what can be done, and what a challenge to stretch ourselves to new heights!